Denim Parker's lab mates wait for his reaction after he tastes a jellybean. The students sat in their desks, eyeing the pile of candy in front of them. As soon as they were given the green light, students reached for jelly beans, chewed in anticipation, and, in most cases, spit them right back out again. 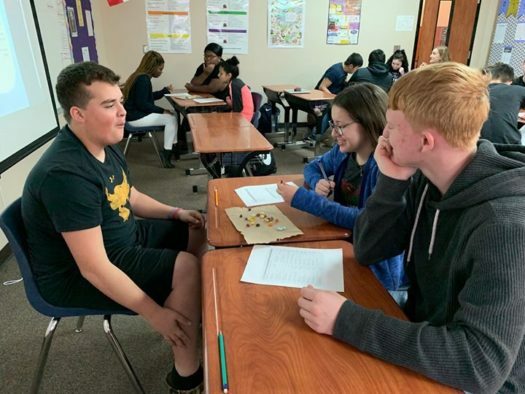 The biology classes participated in a lab where they used a dichotomous key to figure out jelly bean flavors. “We have been learning in class how dichotomous keys are tools that help users identify certain items,” freshman Kamrin Sotelo said. “I was excited to give a dichotomous key a try by trying to figure out certain jelly bean flavors. The students were put into groups and given a mixture of both good and nasty flavored jelly beans. Differently, at times students would seem sure of what a jelly bean flavor was due to its vibrant color; however, when looking at the dichotomous key they understood the importance of more than just color. Overall, this lab helped struggling students get a better look at dichotomous keys in a fun and different way.